Preeclampsia is a unique disorder of human pregnancy with a significant impact on maternal and perinatal morbidity and mortality worldwide. The etiology of the disease is unknown; however, several studies have reported that this condition results due to abnormal placentation and fetomaternal unit perfusion with widespread maternal endothelial dysfunction., For early detection of the disease, several biomarkers and their association to preeclampsia have been studied. Currently, available evidence concerning the effect of adiposity and obesity markers on circulating irisin has been controversial.,,,, These conflicting views underscore the need for studies on the possible link between irisin and preeclampsia independent of body mass index (BMI) and to address the possible application of irisin as a biomarker in clinical practice. The aim of the current study was to investigate the levels of serum irisin in a sample of Iraqi women with normotensive and preeclamptic pregnancies in their third trimester of gestation. A prospective case–control study was performed in Iraq-Baghdad city at Al-Yarmouk Teaching Hospital, Department of Obstetrics and Gynecology during the period from October 1, 2017, to May 1, 2018. The protocol of the study was approved by the Local Medical Research Ethics Committee of AL-Yarmouk Teaching Hospital, Department of Obstetrics and Gynecology. Informed consent was obtained from all participants before embarking them in the study. The study population was 80 Iraqi pregnant women in their third trimester of singleton pregnancy with living fetus; their gestational age ranged from 28 to 40 weeks, the weeks of gestational was calculated from the last menstrual period and confirmed by early sonographic examination taken during the first trimester of pregnancy. Two groups were defined: the control group included 40 pregnant women with singleton uncomplicated normotensive pregnancies presented for routine antenatal visits or pregnant women admitted for elective cesarean section and the study group included other 40 preeclamptic pregnant women who were diagnosed at the time of admission. The women in both groups were matched for maternal age, BMI which has been calculated by the standard equation (kg/m2) from data already collected from antenatal records, gestational age, and parity. The exclusion criteria were pregnant women with diabetes mellitus, chronic liver or renal disease, cancer, chronic cardiac disease, active labor, pregnancies with infection, multiple gestation, intrauterine growth retardation, intrauterine death, and microsomia. Preeclampsia was defined as blood pressure ≥140 mmHg systolic or ≥90 mmHg diastolic measured at two separate occasions at 4–6 h apart after 20 weeks of gestation in previously normotensive woman and 1+ proteinuria in dipstick reading, or in the absence of proteinuria, recently discovered hypertension with the new onset of any of the following: thrombocytopenia (<100,000/μl), renal impairment (serum creatinine concentrations >1.1 mg/dL), liver dysfunction (elevated blood concentrations of liver enzymes to twice normal concentration), pulmonary edema, and cerebral or visual symptoms. A volume of 7 ml blood samples were taken from all participants after overnight fasting by standard peripheral venipuncture techniques. Five ml of the collected blood was sent for general investigations including: blood group and rhesus factor, complete blood count, liver function test (serum glutamic oxaloacetic transaminase, serum glutamic pyruvic transaminase, total serum bilirubin, and serum alkaline phosphatase), renal function test (blood urea and serum creatinine), and serum uric acid. The other 2 ml were used for determination of irisin levels. The collected blood samples were transferred into plane tubes allowed to clot at room temperature for 10–20 min, and then, the clotted blood was centrifuged for about 20 min. Serum samples were stored at −80°C until the analyses were performed. Irisin serum concentration was measured using the enzyme-linked immunosorbent assay (ELISA) kits (Shanghai Yehua Biological Technology Co., Ltd, Shanghai, China) in accordance with the manufacturer's instructions. To assay, the specimen, 40 μL of human serum was required. The kit uses ELISA based on biotin double antibody sandwich technology to assay Human Irisin. Analysis of data was carried out using the Statistical Package for the Social Sciences version 25 (IBM Company, Armonk, New York, USA). The data were presented as mean and standard deviation for normally distributed data and median and interquartile range for irisin as it was not normally distributed. Student's t-test (two-tailed) was used to compare the continuous variables between study groups. 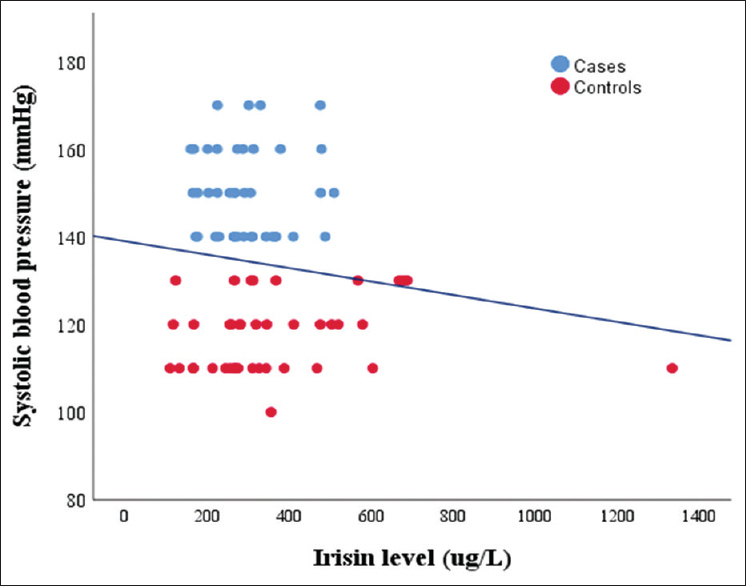 Mann–Whitney U-test nonparametric test was used to compare irisin levels between the study groups. Pearson's correlation was used to assess the correlations of irisin with demographic and other parameters while Spearman's correlation used for the association of irisin level with systolic and diastolic blood pressure. The correlation was considered weak when the coefficient of correlation (r) (0–0.3), moderate if (r = 0.3–0.7) and strong when (r > 0.7), if the correlation preceded by (+) sign then the correlation is direct or positive, while if it was preceded by (−) sign then the correlation is inverse or negative. A level of P < 0.05 was significant. Regarding [Table 1], it demonstrates that there was no significant difference between the study groups regarding the age, parity, BMI, and the weeks of gestation, as P > 0.05. [Table 2] and [Figure 1] show that systolic and diastolic blood pressure were higher among cases compared to controls and the difference was statistically significant as the P < 0.001, but serum irisin level was higher among control group even if it failed to reach significant level as the P > 0.05. [Figure 2] and [Figure 3] show the association curve (scatter-plot graph according to Spearman's correlation) between serum irisin and both systolic and diastolic blood pressure according to study groups. It appears that systolic and diastolic blood pressures were significantly higher among cases, but the irisin level was higher among the control group even if it failed to reach significant level. Nevertheless, neither systolic nor diastolic blood pressure had significant association with serum irisin. Regarding [Table 3], it demonstrates the correlation of irisin levels with demographic and other clinical parameters, which were not significant. Till now, the etiology of preeclampsia remains vague with a lot of debates and represents one of the mysteries of our time. A better understanding of the pathophysiology of preeclampsia can result in the improvement of the outcome of pregnancy. Unfortunately, there is no approved clinical screening or diagnostic tool for preeclampsia, but the discovery of new biomarkers has revolutionized the prediction of this syndrome. In the current study, the relationship between the levels of irisin and preeclampsia has already been studied. Serum irisin levels during the third trimester were found to be lower in preeclamptic women than normotensive pregnancy, but the difference was statistically not significant. The above data are in agreement with the results obtained by Garcés et al. in 2014 and with the findings reported by Zhang et al. who studied the difference in serum irisin level between all types of preeclampsia and they concluded that there was no significant difference between mild and severe preeclamptic patients and normotensive healthy pregnant women. They also measured irisin levels in all trimesters, and they found no statistical difference., On the other hand, Foda et al. 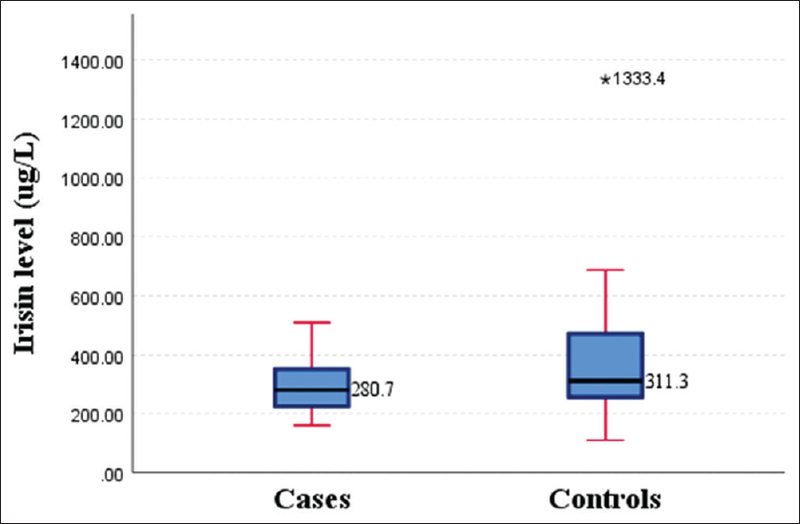 in 2017 reported that serum level of irisin was lower in mild preeclamptic than normotensive controls and it was higher in patients delivered vaginally than those who delivered by cesarean section. They also found that serum irisin level increased after vaginal delivery and its level was higher at the end of delivery than at the early stage. In this study, the blood pressure (both systolic and diastolic) was highly elevated in preeclamptic patients compared to normotensive controls and the difference was significant with a P < 0.001. Nevertheless, neither systolic nor diastolic blood pressure had significant association with serum irisin. Zhang et al. found that serum irisin was negatively associated with systolic and diastolic blood pressure and concluded that irisin may regulate blood pressure level in preeclapmtic patents, what was different from the results of the current study. In the present study, the target groups were those who were not in active labor; this aimed to minimize its effect on irisin level. Foda et al. in 2017 studied the relation between vaginal delivery and serum irisin level and they found that the stress of labor is a major stimulus to the release of irisin. The collection of blood samples was done for all participants while they were at rest, fasting overnight, and before the time of operation, thus, to overcome the effect of afternoon exercise on irisin level. Nathan et al. in 2017 reported that serum levels of irisin increased following afternoon activity because irisin is an exercise-responsive myokine. According to the findings of the current study, there was no significant difference regarding the age, parity, BMI, and the weeks of gestation as the P > 0.05, thus, to eliminate the effect of these parameters on serum levels of irisin and that no BMI differences influenced the results. Considerable contradictory data that correlate serum irisin with body weight, BMI, and fat mass have been found. Some studies reported lower irisin levels with increased weight,,,, others reported higher levels in obese individuals.,, Nonetheless, other groups have found evidence of no association. All previously published articles on the subject that confirmed the current study findings did not adjust for BMI and compared between groups of different BMI. In view of the above findings, it is possible that this decrease in serum levels of irisin could be a consequence of a reduction in placental contribution as placental function affects the weight of the fetus in the group of preeclamptic women. This study discovers the possible placental contribution to altered irisin levels among women with preeclampsia in contrast to women who had normal pregnancies that can be beneficial for using irisin as a potential biomarker for the detection and early diagnosis of this disease. This study will help the researchers to uncover the critical areas of concern through considering the placental components of preeclampsia that many researchers were not able to explore. Thus, a new theory on pathogenesis of preeclampsia may arrive and this might open a large window of opportunity for researchers to discover whether such low levels of circulating irisin are involved in the pathogenesis of the disease or that the placental abnormalities that characterize preeclampsia are the possible explanation for such lower levels. Irisin might be involved as a biomarker for pregnancy-associated problems such as preeclampsia. Its level was lower in preeclamptic patients than normotensive pregnant women although it does not reach significant result. Masoura S, Kalogiannidis IA, Gitas G, Goutsioulis A, Koiou E, Athanasiadis A, et al. Biomarkers in pre-eclampsia: A novel approach to early detection of the disease. J Obstet Gynaecol 2012;32:609-16. Maynard SE, Karumanchi SA. Angiogenic factors and preeclampsia. Semin Nephrol 2011;31:33-46. Petla LT, Chikkala R, Ratnakar KS, Kodati V, Sritharan V. Biomarkers for the management of pre-eclampsia in pregnant women. Indian J Med Res 2013;138:60-7. Boström PA, Graham EL, Georgiadi A, Ma X. Impact of exercise on muscle and nonmuscle organs. IUBMB Life 2013;65:845-50. Boström P, Wu J, Jedrychowski MP, Korde A, Ye L, Lo JC, et al. APGC1-α-dependent myokine that drives brown-fat-like development of white fat and thermogenesis. Nature 2012;481:463-8. Wu J, Boström P, Sparks LM, Ye L, Choi JH, Giang AH, et al. Beige adipocytes are a distinct type of thermogenic fat cell in mouse and human. Cell 2012;150:366-76. Song H, Wu F, Zhang Y, Zhang Y, Wang F, Jiang M, et al. Irisin promotes human umbilical vein endothelial cell proliferation through the ERK signaling pathway and partly suppresses high glucose-induced apoptosis. PLoS One 2014;9:e110273. Lu J, Xiang G, Liu M, Mei W, Xiang L, Dong J. Irisin protects against endothelial injury and ameliorates atherosclerosis in apolipoprotein E-null diabetic mice. Atherosclerosis 2015;243:438-48. Song H, Xu J, Lv N, Zhang Y, Wu F, Li H, et al. Irisin reverses platelet derived growth factor-BB-induced vascular smooth muscle cells phenotype modulation through STAT3 signaling pathway. Biochem Biophys Res Commun 2016;479:139-45. Zhang Y, Song H, Zhang Y, Wu F, Mu Q, Jiang M, et al. Irisin inhibits atherosclerosis by promoting endothelial proliferation through microRNA126-5p. J Am Heart Assoc 2016;5. pii: e004031. Garcés MF, Peralta JJ, Ruiz-Linares CE, Lozano AR, Poveda NE, Torres-Sierra AL, et al. 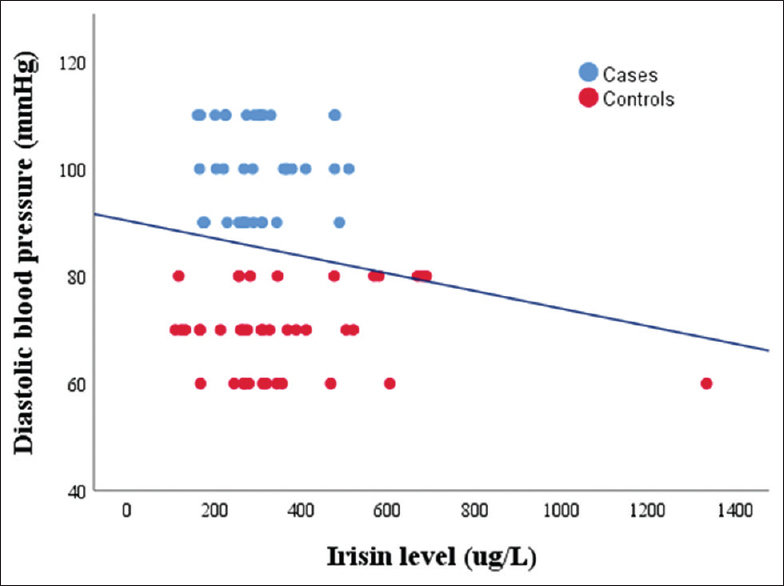 Irisin levels during pregnancy and changes associated with the development of preeclampsia. J Clin Endocrinol Metab 2014;99:2113-9. Joung KE, Park KH, Filippaios A, Dincer F, Christou H, Mantzoros CS. Cord blood irisin levels are positively correlated with birth weight in newborn infants. Metabolism 2015;64:1507-14. Yan B, Shi X, Zhang H, Pan L, Ma Z, Liu S, et al. Association of serum irisin with metabolic syndrome in obese Chinese adults. PLoS One 2014;9:e94235. Stengel A, Hofmann T, Goebel-Stengel M, Elbelt U, Kobelt P, Klapp BF, et al. Circulating levels of irisin in patients with anorexia nervosa and different stages of obesity – Correlation with body mass index. Peptides 2013;39:125-30. Blüher S, Panagiotou G, Petroff D, Markert J, Wagner A, Klemm T, et al. Effects of a 1-year exercise and lifestyle intervention on irisin, adipokines, and inflammatory markers in obese children. Obesity (Silver Spring) 2014;22:1701-8. Fisher SJ. Why is placentation abnormal in preeclampsia? Am J Obstet Gynecol 2015;213:S115-22. Young BC, Levine RJ, Karumanchi SA. Pathogenesis of preeclampsia. Annu Rev Pathol 2010;5:173-92. Zhang LJ, Xie Q, Tang CS, Zhang AH. Expressions of irisin and urotensin II and their relationships with blood pressure in patients with preeclampsia. Clin Exp Hypertens 2017;39:460-7. Foda AA, Foda EA. Effect of delivery on maternal and neonatal irisin level in normal and preeclamptic pregnant women. Pregnancy Hypertens 2017;10:226-9. Winn NC, Grunewald ZI, Liu Y, Heden TD, Nyhoff LM, Kanaley JA, et al. Plasma irisin modestly increases during moderate and high-intensity afternoon exercise in obese females. PLoS One 2017;12:e0170690. Barja-Fernández S, Folgueira C, Castelao C, Al-Massadi O, Bravo SB, Garcia-Caballero T, et al. FNDC5 is produced in the stomach and associated to body composition. Sci Rep 2016;6:23067. Fukushima Y, Kurose S, Shinno H, Cao Thi Thu H, Tamanoi A, Tsutsumi H, et al. Relationships between serum irisin levels and metabolic parameters in Japanese patients with obesity. Obes Sci Pract 2016;2:203-9. Crujeiras AB, Pardo M, Arturo RR, Navas-Carretero S, Zulet MA, Martínez JA, et al. Longitudinal variation of circulating irisin after an energy restriction-induced weight loss and following weight regain in obese men and women. Am J Hum Biol 2014;26:198-207. Lambert G, Brichant JF, Hartstein G, Bonhomme V, Dewandre PY. Preeclampsia: An update. Acta Anaesthesiol Belg 2014;65:137-49.